Both Ira and Tara sat front row at Ridhi Mehra’s show wearing, you guessed it, outfits by the designer. Wearing their hair in ponytails, both ladies rounded out the look with understated jewelry. While both Ira and Tara wear their outfits well, neither look really made us sit up and take notice. 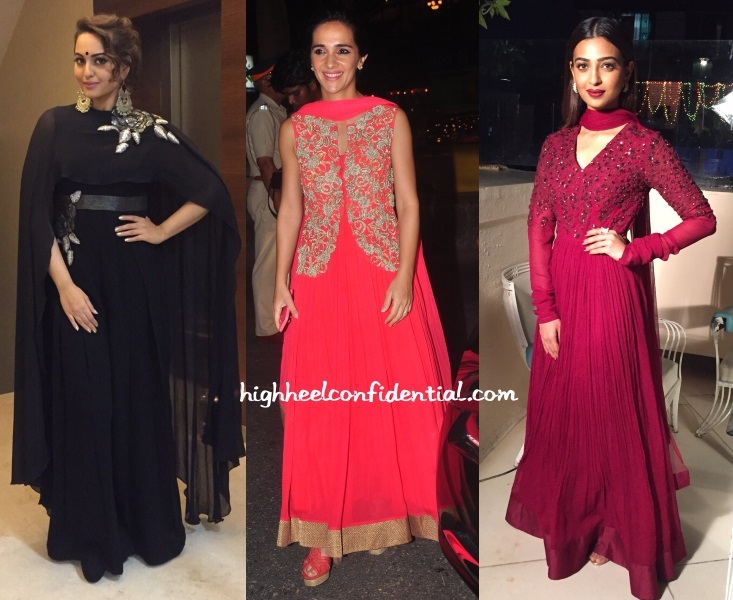 At Diwali related events, these ladies were seen in Ridhi Mehra designs. While they all looked pretty in their outfits, are you drawn more to one? P.S. Sonakshi is wearing Ritika Sachdeva earrings and Radhika is wearing jewellery from Shaheen Abbas Fine Jewellery. For her appearance at a recent event, Tara picked an Archana Kochhar gown. A soft updo and minimal jewelry is all that it took to finish out the look. We may not be big on the gown personally, but will admit, Tara did look on the red carpet. For her appearance at a recent event, Tara chose Zara. Maroon lip color, braided hair, black bag and sandals completed the look. Props for changing up the do! As for the look as a whole, you tell us… Like what you see? Tara attended a jewelry collection launch wearing a jewel-toned midi dress from Madison. With her hair set in soft waves, she finished out the look with drop earrings and t-strap sandals. Love the color on her and she definitely needs to wear more of it! That said, do wish she had done something different with her hair. Between the length of her hair and the dress, and the ankle-straps of her sandals, the proportions seemed choppy. Not a deal-breaker though, the color makes up for it! She looked rather charming.